People dream about working from home. However, most people have this fictional, yet idealistic view of what it looks like to work from home. They assume that it involves waking up late, watching TV, working in your pajamas, and eating junk food. If you’re doing these things, though, you probably aren’t being as productive as possible. There are numerous advantages to working from home. You don’t have to deal with traffic and long commutes. There aren’t the distractions of noisy co-workers and undesirable work conditions. You don’t have to deal with a boss breathing down your neck. There’s no requirement for a suit and tie. The list goes on and on. But there are also a number of distinct challenges that come with the work-from-home lifestyle. For starters, working from home can be lonely – especially for extroverts who thrive on interacting with others. But the biggest issue is the distractions that are present at home. It’s often challenging for people to separate work responsibilities from home responsibilities. In order to be a productive work-from-home writer, you must be aware of these challenges. If you’ve worked in a nine-to-five corporate environment for your entire career, then it’s hard to know exactly how much things will change when you transition. Just know that they will change and be prepared to shift your approach accordingly. Maximizing productivity in a home work environment is all about establishing your priorities and making conscious decisions to create boundaries and rules. Here are a few helpful tips that many find useful in their daily routines. The trouble most people have with working from home is that they don’t have a proper strategy for removing distractions. The biggest issue is that people will try to work from bed – or from the kitchen table. Unfortunately, this is rarely effective. This office should be used for work and nothing else. As such, when you enter the office, your mind should automatically transition into a frame of mind that’s ready to work. If you’re looking for some inspiration in terms of home office design, there are some really neat tips tucked away in this article. One thing every home office needs is a reminder board. This is a lot like a bulletin board, but it should have a surface that can be written on and erased. The idea is that you jot down little notes and reminders as soon as they pop into your head. Then, before shutting things down at the end of the day, make a habit of glancing at the board and checking on your progress. This ensures you aren’t forgetting anything important. Just because you work from home doesn’t mean you can wake up whenever you want and go to sleep late at night. In order to be productive, you need a schedule. A schedule keeps you honest and ensures you aren’t procrastinating. While everyone is different, the common belief is that people are most productive in the morning and should wake up and get the day started. A consistent schedule allows your brain and body to get into a groove, so to speak. You’ll begin to expect work at certain times of the day and will find it less difficult to block out distractions and focus on what needs to be done. Ironically enough, stepping away from work and taking a break is often the best thing you can do for your overall productivity. The brain wasn’t built for nonstop output. It actually needs some unfocused time in order to recharge. Breaks may also help enhance creativity. “Some studies have shown that the mind solves its stickiest problems while daydreaming – something you may have experienced while driving or taking a shower,” says entrepreneur Courtney Seiter. “Breakthroughs that seem to come out of nowhere are often the product of diffuse mode thinking.” If you’re constantly working and never making any time for daydreaming, where will these solutions and ideas come from? You know yourself better than anyone. If staying focused is a major struggle for you, it may be necessary to find someone to keep you accountable. While accountability partners are typically thought of in terms of personal goals or struggles, who’s to say you can’t have a work accountability partner? Find someone that you trust and ask them to check in on you on a daily basis. Give them permission to ask for periodic progress reports and proof of work. This should give you a little more incentive to stay on track and will hopefully prevent you from totally ignoring the tasks that need to be done. Working from home has its pros and cons, but you can enjoy more of the positives by establishing a productive environment. What are you waiting for? It’s time to add some structure to your job! And if you want to learn 30 techniques for being more effective with content marketing along with valuable insights from 10+ influencers like Mark Schaefer, Rebecca Lieb, Lee Odden, Jason Miller or Ian Cleary, download our free eBook now! 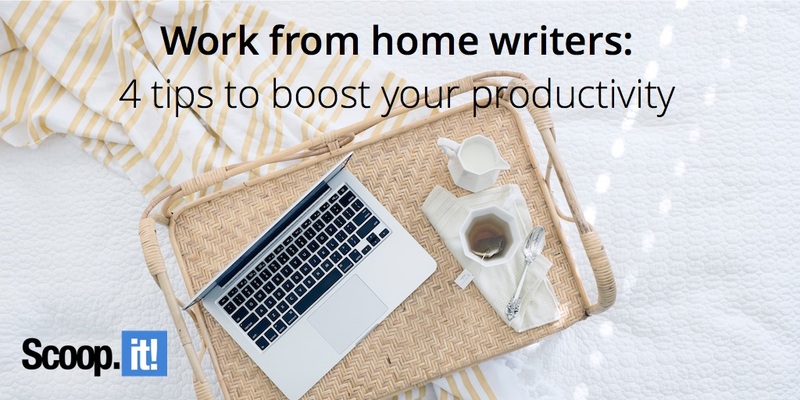 1 Comment on "Work from home writers: 4 tips to boost your productivity"
Finding an accountability partner sound like a great idea. Preferably the one who’s been in the business of working from home for some time. Their experience and mindset can help a lot.